Clean Air in London (CAL) is launching its 35 minute film, One Atmosphere, about the most important lessons learned from 10 years of campaigning on air pollution. The film urges immediate action to reduce local air pollution and greenhouse gases to protect public health and mitigate climate change. The film is based on a presentation by Simon Birkett, Founder and Director of Clean Air in London, at the Clean Air Society of Australia and New Zealand’s (CASANZ) bi-annual conference in Melbourne on 21 September 2015. It has been updated for subsequent events. One Atmosphere can be viewed in full on Vimeo or You Tube. It can also be viewed there in 10 separate chapters starting with an ‘Overview’, then covering the eight sections in the presentation, before highlighting the ‘Opportunity’ to act holistically on air pollution to save lives and achieve wider climate and sustainability objectives. The presentation seen in the film is available below. One Atmosphere tells the story of ‘Clean Air in London’. Many other topics are covered in the film which aims to give anyone an introduction to air pollution and the actions needed to address it with climate change through ‘win-win’ policies. One Atmosphere is being released first in Australia at Environmental Justice Australia’s (EJA) 2015 National Air Pollution Summit in Melbourne on Saturday 14 November. CAL is keen to support EJA and thank CASANZ for hosting the original presentation in Melbourne in September 2015. • Greg Hunt MP, Australia’s Minister for the Environment, to include binding legal limits for NO2 and other air pollutants where people live and work in his forthcoming National Clean Air Agreement. Access to environmental justice is another critical requirement. These steps are vital after Clean Air in London revealed that Australia’s record for having the most liveable cities is based on it having no monitoring of air pollution where people live or work in cities. Simon Birkett was born in Melbourne and completed his first degree there. “One Atmosphere urges David Cameron, Malcolm Turnbull and other world leaders to take a lead at the forthcoming COP21 climate negotiations in Paris by pledging to reduce local air pollution and greenhouse gases to protect public health and mitigate climate change. “This film is also my record of the most important lessons I’ve learned from 10 years of campaigning on air pollution. Clean Air in London has focused every day on its mission to achieve urgently and sustainably full compliance with World Health Organisation guidelines for air quality. We’ve done it by focusing ruthlessly on air pollution in London and those who can reduce it i.e. addressing successive Mayors and UK governments, the European Parliament and European Commission, the World Health Organisation (WHO) and the United Nations. At one stage, a previous government asked us to campaign on nuisance noise but we refused because it would distract us from our core mission. • the need and wonderful opportunity to implement One Atmosphere thinking to reduce local air pollution and greenhouse gases to protect public health and mitigate climate change. “CAL is grateful to Andy Davey for letting us include many of his amazing cartoons about air pollution in One Atmosphere, all of which feature Mayor Johnson. “To encourage the widespread sharing of One Atmosphere, we have chosen a Creative Commons license which lets others remix, tweak, and build upon our work even for commercial purposes, as long as they credit us and license their new creations under the identical terms. The cartoons by Andy Davey included in the film are subject to separate copyright protection with all rights reserved. “I am keen to record special thanks to the Clean Air Society of Australia and New Zealand and VicRoads for sponsoring my presentation in Australia, Jay Hunt Founder and Chief Executive of Violet Productions, cameraman Ryan Blair and Ace Post Production. Special thanks of course to Environmental Justice Australia hosting a landmark National Clean Air Summit. “I am also grateful to Clean Air in London’s Honorary Founder Supporters and Clean Air in Cities Award winners and key sponsors and supporters including Camfil (world leader in air filters for buildings), the New West End Company and the Licensed Taxi Drivers Association (which campaigns, amongst many other things, for taxi drivers to be allowed by the Mayor to buy non-diesel vehicles). “There is a wonderful opportunity for a new clean air revolution almost exactly 60 years after the first national Clean Air Act. We should start by: banning diesel, combined heat and power plants, incinerators and wood burning from the most polluted places; and agreeing ambitious greenhouse gas reduction commitments at COP21 in Paris. xii. the need and wonderful opportunity to implement One Atmosphere thinking to reduce air pollution to save lives and address climate change and sustainability objectives. Many other topics are covered in the film which aims to give anyone an introduction to local air pollution and the actions needed to address it with climate change through ‘win-win’ policies. x. the 60th anniversary of the first national Clean Air Act on 5 July 2016. Of course, there will many other legal, policy and scientific milestones and events for air pollution in the year ahead. One Atmosphere by Simon Birkett is licensed under a Creative Commons Attribution-ShareAlike 4.0 International License. Based on a work at cleanair.london/one-atmosphere. 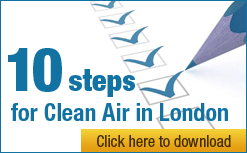 Permissions beyond the scope of this license may be available at cleanair.london/contact.